Background: Pyrazolines have played a pivotal role in antimicrobial and anticancer drug discovery. Moreover, thiazoles have attracted a great deal of interest due to their crucial roles in the lead identification and optimization. Objectives: The purpose of the current work was to design and synthesize new antimicrobial and anticancer agents. Methods: New thiazolyl-pyrazoline derivatives (2a-d) were synthesized via the ring closure reaction of 3-(2-thienyl)-5-(2,6-dichlorophenyl)-1-thiocarbamoyl-2-pyrazoline (1) with phenacyl bromides. The compounds were evaluated for their in vitro antimicrobial effects on pathogenic bacteria and Candida species using Microdilution assay, BacTiter-GloTM microbial cell viability assay and Fluorescence microscopy. The possible binding interactions of compound 1 in the active site of CYP51 were confirmed by molecular docking studies, whereas its genotoxicity was investigated using Ames MPF test. Furthermore, MTT assay was performed to determine the cytotoxic effects of the compounds on A549 human lung adenocarcinoma, HepG2 human hepatocellular carcinoma, C6 rat glioma, and NIH/3T3 mouse embryonic fibroblast cell lines. A computational study for the prediction of ADME properties of all compounds was also performed. 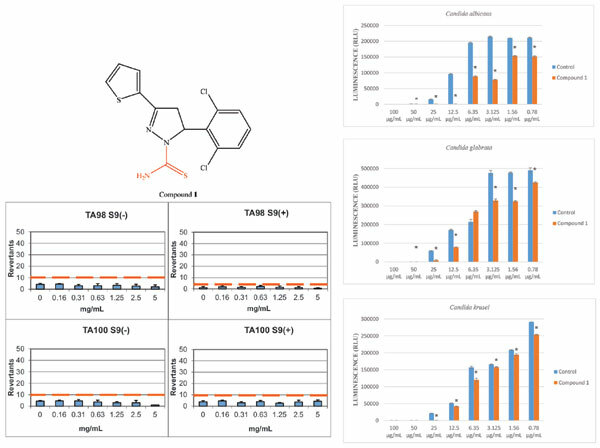 Results: Compound 1 was found to be the most potent anticandidal agent against Candida species. MTT and Ames MPF assays indicated that compound 1 was neither cytotoxic nor genotoxic at the concentrations tested. Docking studies showed that compound 1 interacted with Heme group in the active site of CYP51. This compound also exhibited selective anticancer activity against HepG2 and C6 cell lines. According to in silico studies, this compound did not violate Lipinski’s rule, making it a potential orally bioavailable chemotherapeutic agent. Conclusion: Compound 1 was identified as a promising candidate for further mechanistic studies. Pyrazoline, thiazole, antimicrobial activity, cytotoxicity, genotoxicity, anticancer.